Apple Pay became available in Ireland this morning, marking the 14th country to accept Apple's payments service. Visa and MasterCard holders that bank with KBC and Ulster Bank can use Apple Pay in the country, and the service also works with the Boon prepay system. Apple Pay is available to all customers with an iPhone SE, 6, 6s, 6 Plus, 6s Plus, 7, 7 Plus, or an iPhone 5 or later when paired with the Apple Watch. Apple Pay can also be used within apps and on the web with an eligible iPhone, iPad, or MacBook Pro with Touch ID. Apple Pay can be set up using the Wallet app on all supported devices. 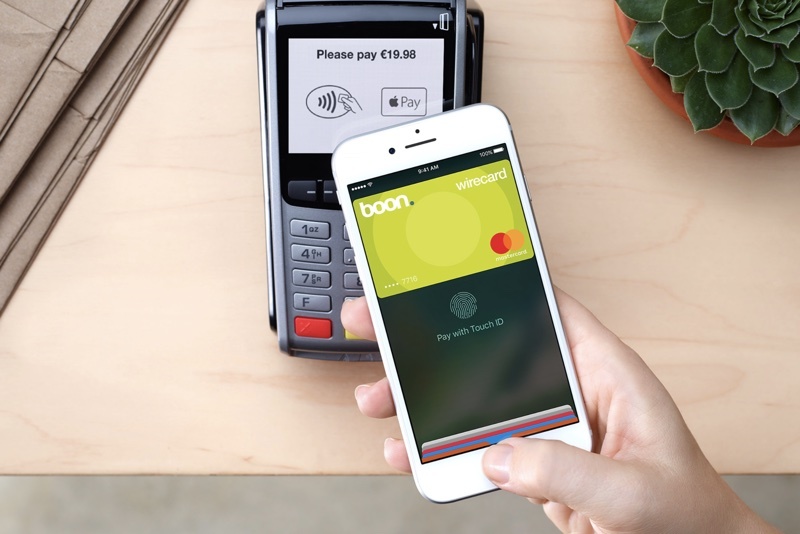 Participating retailers in Ireland include Aldi, Amber Oil, Applegreen, Boots, Burger King, Centra, Dunnes Stores, Harvey Norman, Lidl, Marks and Spencers, PostPoint, SuperValu, and more, with a full list of participating retailers available on the Ireland Apple Pay website. Along with Ireland, Apple Pay is available in U.S., UK, China, Australia, Canada, Switzerland, France, Hong Kong, Russia, Singapore, Japan, New Zealand, and Spain. Taiwan is next on the list to get Apple Pay, with seven banks in the country having recently obtained permission from the Financial Supervisory Commission to offer the payments service. Please bring Apple Pay to more countries. My future iPhone 8 would be so awesome if I could also pay with it. KBC and Ulster are minnow banks in Ireland, so nothing really to see here. What I cannot fathom though is why it is taking so long for Apple to roll this out for everyone across the EU. It's taking so long that we're surpassing the utility of Apple Pay, virtually every debit card in Ireland can be used for contactless payments now and the terminals are almost ubiquitous now so there's no longer a potential extra convenience in using Apple Pay that might have existed when it was rolled out years ago in the US. Bring Apple Pay to Poland please! It's the most innovations friendly country in the EU in terms of paying. We were second country in the EU to adopt Android Pay (after UK), yet we still don't have Apple Pay! Ireland???!!???? Home of the infamous DCC scam on foreigners, and per-transaction charges from your bank for locals. The only place I know of where banks charge you to use your debit card. God. I don't get charged for mine. Any chance you can back this tripe up with some facts? Nice. KBC is actually a Belgian bank. So maybe Belgium is in the pipeline? Come to the Netherlands, please. German Banking Instituts will probably accept it in 10 years. The old farts sitting there won't accept the transaction fee of Apple. And the shops here are doing there own payment solutions to not lose the tracking of customer buying habits.